I was weary about this episode and recipe. My husband is not a fan of rice, and how good can Rice Pilaf be??? Well once again Alton has proved to me that he can make anything delicious. 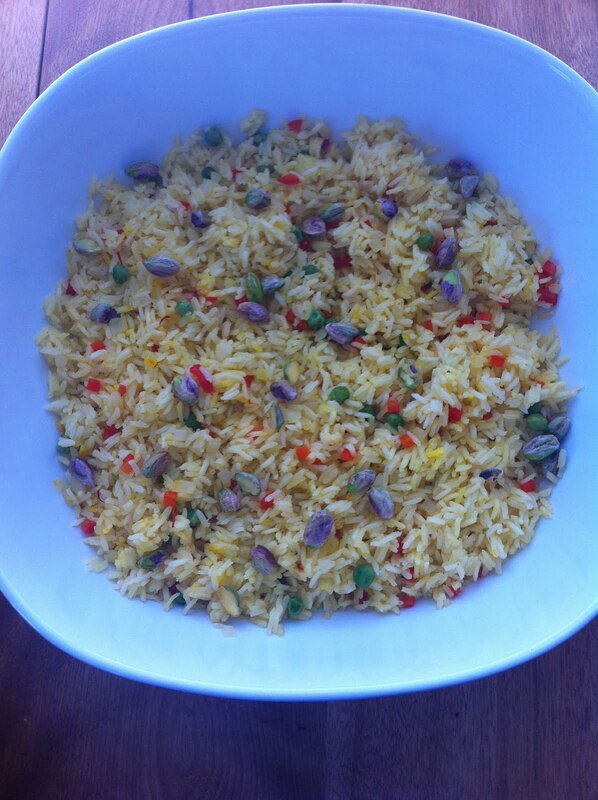 I’ve never made rice pilaf before and this was really quite easy to make and very tasty. I learned so much. Who knew there was so much information to learn about a tiny little grain. If you think about it so many cultures eat rice. In fact 2/3 of the planet fuel up on it. It’s versatile, cheap and even hypoallergenic…who knew. There are literally thousands of varieties of rice. Wild rice isn’t even a rice, it’s an aquatic grass. There are two things you need to know when cooking rice, the grain length and how it’s processed. All rice falls into 3 commercial classifications…long grain, medium grain and short grain. Easy to remember, right? Short grain rice is mostly grown in Asia and California and are sticky when cooked ie. sushi rice. The starch coating on medium grain rice like arborio is released into the liquid which creates the creaminess of dishes like risotto. They are fluffy when cooked, but get sticky as they cool down and since their starch doesn’t crystallize they are a good choice for cold dishes like salads. Long grain rice does not release starch like medium and short grain rice does so you get fluffy, separated, “American” rice. Long grain is a great all purpose rice, however the starch in the long grain rice crystallizes when cold which turns it into rock hard little grains, but can be reheated nicely because the crystals do dissolve when warm. The Husk is removed to make brown rice leaving the bran, and the bran is removed to make white rice. Brown rice needs 3 times more water and cook time than white rice. White rice can be stored in an airtight container for a year on the shelf, brown rice on the other hand only lasts about six months because of the oils in the bran. You can however store the brown rice in the freezer for 1-2 years in a zip top bag. Rice cooker or no rice cooker? I have a small house, so one more bulky kitchen appliance is not an option for me. Rice cookers are good if you have the space simply because they monitor the temperature and adjust as need while your rice cooks. But remember, you can’t make risotto, rice pudding or pilaf in a rice cooker. Fun fact: Rice is a sign of fertility and that’s why we’ve been throwing it at weddings for the last few millennia. Well, that was the case until birds started eating it and…you know the ending to that story. And one more fact, pilaf is a method of cooking, not what goes into it. Now you have way more knowledge than you will probably ever need on rice, but I hope this comes in handy for you one day. Enjoy this recipe, as I did!